How Does Intel’s RealSense Tracking Camera T265 Stack Up Against the Structure Core? The new T265 provides a mix of Visual Inertial Odometry (VIO) and Simultaneous Localization and Mapping (SLAM). In simple terms, SLAM is a procedure wherein a computer scans the surrounding areas and the nearby environment. These scans are then used to construct a digital map that can be used for real world simulations. This is the underlying process used by many ARKit Apps for detecting surfaces. Visual Inertial Odometry (VIO) is a fusion of information from a camera and it’s inertial sensors like gyroscopes and accelerometers which estimate device position and orientation. According to Qualcomm research, single cameras fail to capture absolute scales, i.e. actual distances between objects. Inertial sensors bridge this gap but are more susceptible to drifts in position estimates. Hence the blend of both Inertial sensors and cameras, called VIO, provide accurate device pose. Intel decided to call this combination of technology V-SLAM. 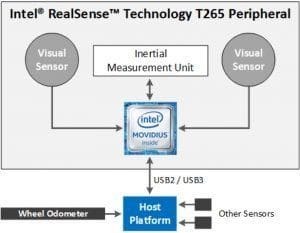 The Intel RealSense Tracking Camera T265 consisted of two fisheye lens sensors, an Inertial Measurement Unit (IMU) and a Intel Movidius Myriad 2 Visual Processing Units (VPU). The VPU is a system on chip component built primarily for image processing and computer vision. Its architectural features include: Vector Processor cores, Hardware accelerators and General-purpose RISC CPU cores. This assembly is where all the V-SLAM algorithms run directly on the VPU and help it consume power more efficiently. The T265 also boasts of offering sub 6ms latency between movement and reflection of movement in the post. This facilitates its usage for high sensitivity applications like augmented reality and virtual reality. According to Gartner, the critical aspect for all drones, robots and mobile devices to be autonomous is their ability to intelligently interact with the environment. Successful navigation through unfamiliar spaces and avoiding obstacles are primary concerns for autonomous devices. The Intel T265 apparently addresses this challenge through its standalone six-degree-of-freedom (6DOF) system. 6DOF is the range of motions that a head mounted display allows its users to move on its axis in relation to the virtual content. The range of motions include, Yaw which is the left and right movement, Pitch which is the forward and backward movement and the Roll which is the circular motion, for the user’s head. The other 3 motions pertain to movement within the space – left, right, forward and backwards, and up and down. The T265 has been designed to work with small footprint mobile devices including drones and robots. 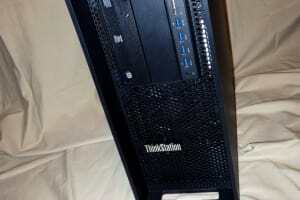 The Intel T265 is currently retailing at $199. The Intel T265 has possibly broken new ground for visual inertial tracking with very efficient cost and power consumption. This could pave the way for widespread applications in commercial robots, AR and Drone guidance thus bolstering the future of autonomous tracking. How does the Intel RealSense compare to the Occipital Core? 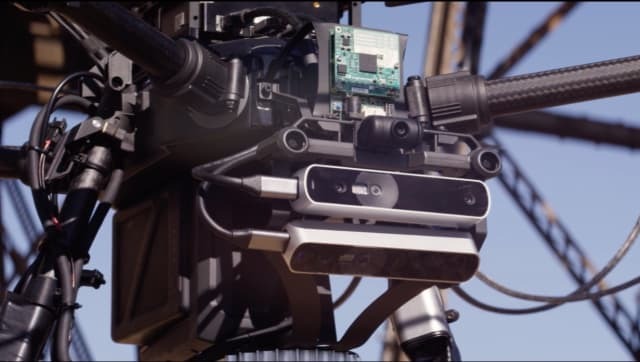 In November of 2018, Occipital announced the availability of its new Structure Core sensor, pictured above attached to this drone. (Image courtesy of Occipital). 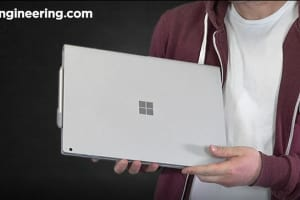 According to Occipital, the Structure Core sensors are shipping at a cost of USD 399 next month in March. They have an early access program where eager customers can pay USD 499 to get one this month. 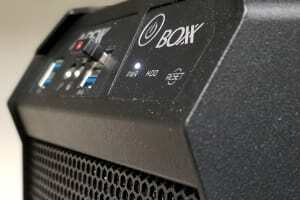 The Structure Core is built around a high contrast infrared pattern projector and twin infrared cameras. Occipital claims that the Structure Core works in direct sunlight, and the two infrared cameras even capture data of moving objects. Part of the reason the Structure Core can work both in sunlight and capture the scan data of moving objects is due to their synchronization with a global shutter. A rolling shutter scans an image in sequence, starting at the top of a scene or object and moving down one line at a time. In contrast a global shutter scans the entire scene or object simultaneously. The Structure Core has an additional RGB camera if users want registered RGBD images (meaning mapped consecutive frames are transformed into one coordinate system), or they can choose to deploy it as an ultra-wide angle visible light camera. It has 6-DoF of positional tracking thanks to an IMU and an SDK to create depth maps and point clouds of different scenes and objects. The Structure Core has a bit more to work with because of its SDK and integrated IMU. 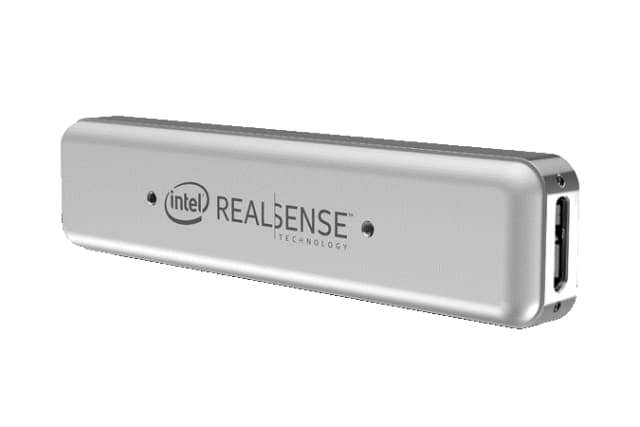 The Intel RealSense T265 tracking camera has a 6-DoF system, Intel RealSense SDK 2.0, an IMU and a VPU, but the Structure Core has depth for scale 3D scanning with a fully-synchronized IMU. Both devices are indicative of a more potent accessory for robotics and drone enthusiasts. Most other 3D sensors do not offer the capabilities of either the RealSense or the Structure Core. This kind of technology is usually baked into indoor robots or high-end AR headsets like Magic Leap One or the Microsoft HoloLens. The fact that all of this technology is on these two devices means that builders, makers and engineers will have less parts and components to integrate into the multiple systems that work together to create products with high levels of spatial awareness, like UAVs and drones. Though it is incredibly creepy in many ways, it seems like the overall plan from tech companies large and small is to integrate robots and drones further into the life of an average citizen. Small flying drones taking pictures of their owners while flying around them to post to social media, robots in homes doing incrementally more and more than just vacuuming up dust and filth. The technology designed into smartphones is used in robotics, and robots designed for mass production and consumption will be designed to be learning machines who are aware of their environments. For years Qualcomm Research, the R&D division of Qualcomm Technologies, Inc., has been at the forefront of sensor fusion, computer vision and machine learning technologies—innovations that will enable smarter robots and drones to “see” in 3D, sense their surroundings, avoid collision, and autonomously navigate their environments. A robot has to understand its relative position and orientation when moving through a new environment that it does not yet know. The technology in both the RealSense and the Structure Core are capable of position and orientation tracking with 6-DoF which is vital to robotic systems to process during indoor navigation. VR, AR headsets use the same type of technology, which is why companies like Qualcomm use Visual-Inertial Odometry (VIO), which integrates data from both inertial sensors like accelerometers and gyroscopes to calculate device pose without input from a GPS component. 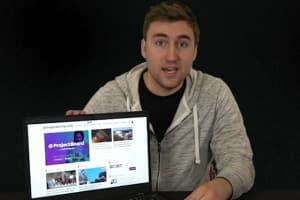 It’s hard to know which device is better, the Occipital Structure Core or the Intel RealSense T265 without testing them objectively. If cost is a concern, the RealSense is USD 200 cheaper. The Structure Core’s features seem more powerful, and the 6-DoF integrated IMU seems more robust than the twin Movidius-enabled 6-Dof system from Intel. It’s hard to say which is better without objectively testing them. But these two are definitely competing for the same customers. We’ll keep you posted on which one is better for different applications involving robotics and drones in the coming months.